FONTANA, CA – Cheered on by parents, students and staff, nearly 200 Fontana Unified students with special needs raced across a track, warmed up their throwing arms and tested their long jump skills during the sixth annual Splash and Dash, an event that builds relationships and celebrates diversity. The May 11 event, held at Henry J. Kaiser High School, brought together students from Kaiser’s general education program and the District’s seven high school special education programs for a day of friendly competition and healthy activities. Since it began in 2013, Splash and Dash has become of the largest district special education events in California. Students with special needs ran through a tunnel of cheering Kaiser students on their way to a welcome breakfast and community health fair, which featured booths for the Los Angeles City Fire Department, Fontana Police Explorers and local health agencies. Students then paraded across campus toward the stadium, where they gathered for an opening ceremony with performances from Kaiser’s marching band, cheer team and JROTC students. Kaiser student volunteers competed alongside students with special needs during track and field events like the 100-meter dash, softball throw, wheelchair race and long jump. This year, the event debuted a sensory obstacle course for students with more involved disabilities. Had weather permitted, the event would have also featured water challenges like a water balloon toss, sponge pass and bottle-filling relay. Kaiser High Principal Terry Abernathy said the District plans to expand Splash and Dash to a three-day event open to elementary, middle and high school students. A.B. 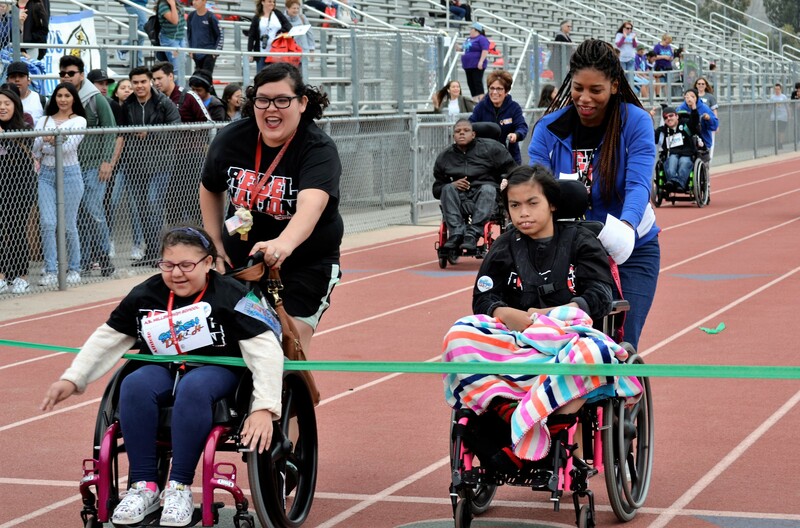 Miller High students with special needs and staff cross the finish line during the wheelchair race on May 11 at Splash and Dash, an annual event that builds student relationships and promotes inclusivity.